According to the Growth Accelerator Hyper Growth Insights Study 2014, 96% of hyper growth businesses planned their ambitious growth in the previous year – this reconciles with our own experience that growth and success don’t tend to happen by chance. Well-chosen goals and objectives point a new business in the right direction and keep an established business on the right track. They give a sense of meaning and purpose – a sense of direction that flows throughout your organisation. You may not know where to start and it may may feel overwhelming, but don’t procrastinate because you don’t feel prepared. It may not be urgent but it is definitely important so start today. They need to be clear and they need to be written down. But they also need to be SMART: Specific, Measurable, Attainable, Realistic and Time-framed. Your goals must state exactly what you need to achieve. An example a Specific goal might be “We expect to gain 50 new customers by the end of June”. Your progress needs to be measured and monitored so make sure you set goals that can be properly measured. Be clear about who is accountable for their delivery – ie who is in charge of making them happen. Are you being realistic and relevant to what your business does and to your market? There’s no point in setting an unattainable goal. If your turnover has never been more than £100,000 don’t set next year’s goal at £1o million. Try to involve everyone . Sharing the planning will help everyone understand the direction your business is heading in and focus them on achievement. 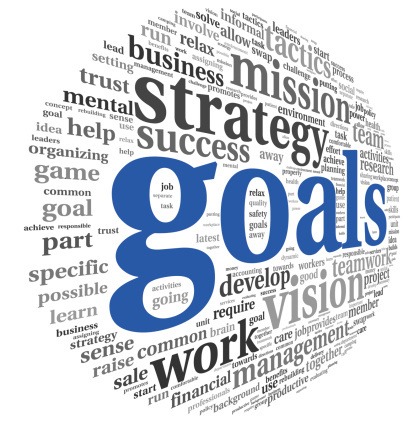 Your goals become the team’s which become the company’s … and then set your KPIs to measure them regularly! Setting and achieving goals is a process that requires regular ongoing attention – tricky when you’re trying to run a small business and all the aspects that entails. However, it’s no good setting goals for the start of a New Year but not looking at them again until mid-year; set milestones, weekly, and monthly actions you will take to achieve them. When you set goals you tend to focus on the end result and it’s easy to lose track of successes that happen in between. Set milestones and celebrate the achievement of each milestone. This also ensures you monitor and measure each success that helped you achieve the overall goal.